Affiliate links have been used. For my complete disclosure policy, read here. 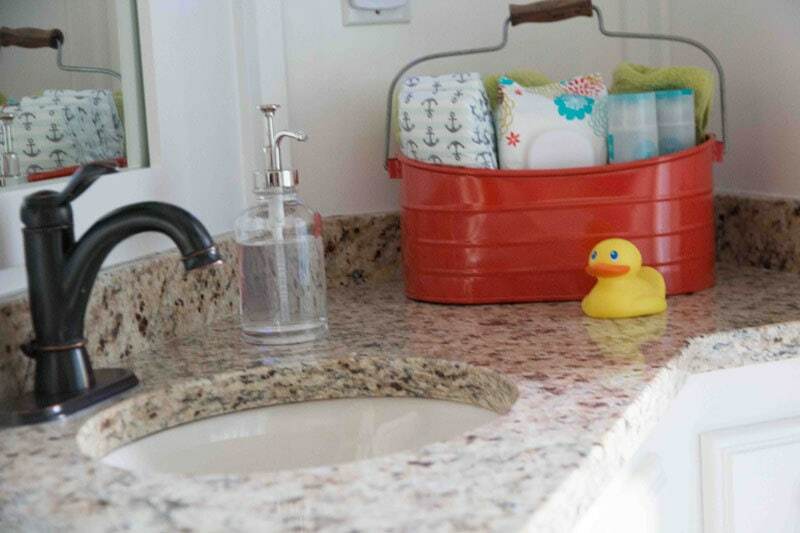 The key to saving money on bathroom remodels is using what you already have. Yeah, no surprise here! 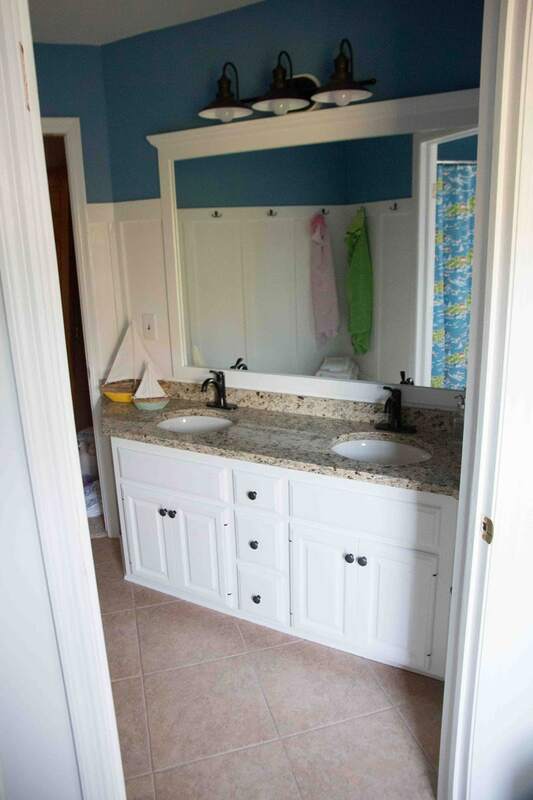 But, you will be surprised, we redid two of our bathrooms for under 1K! That is pretty much unheard of. And you know why? We didn’t change the layout, we used everything we had, kept all the plumbing intact, and we DIYed everything. 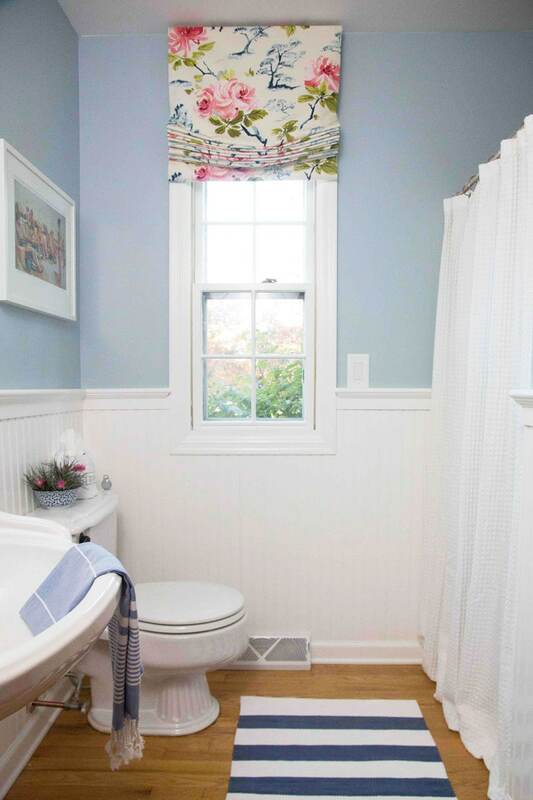 Changing the layout of your bathroom, and changing out the facilities costs money. Replacing toilets isn’t cheap, and neither are sinks, showers, and tile. So we kept everything we had and through some simple decorating and DIY, we disguised the ugliness (and made the bathroom look updated when it is in reality the same old 1980s everything!) How did we do it? Scroll down to see all my tips & tricks! 2.) PAINT IT or HIDE IT! 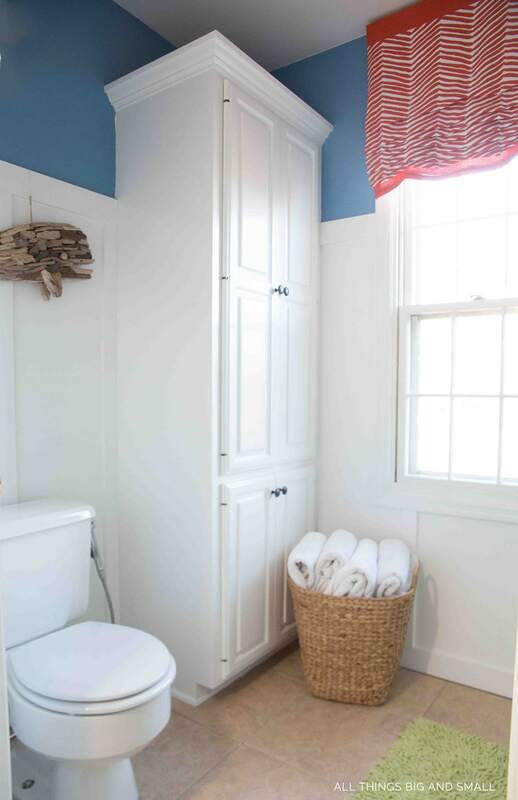 For our upstairs bathroom remodel, we kept the existing cabinets because they were in good shape, and just painted that ugly outdated oak–see my guide on how to paint cabinets like a pro! Suddenly, it wasn’t brown-on-brown-on-brown anymore. Gone were the brown woodwork cabinets, brown walls, and brown light fixtures! We also painted the walls and added DIY board and batten (upstairs) and beadboard bathroom downstairs–drawing your eye away from old stuff. Now the room is white and bright! 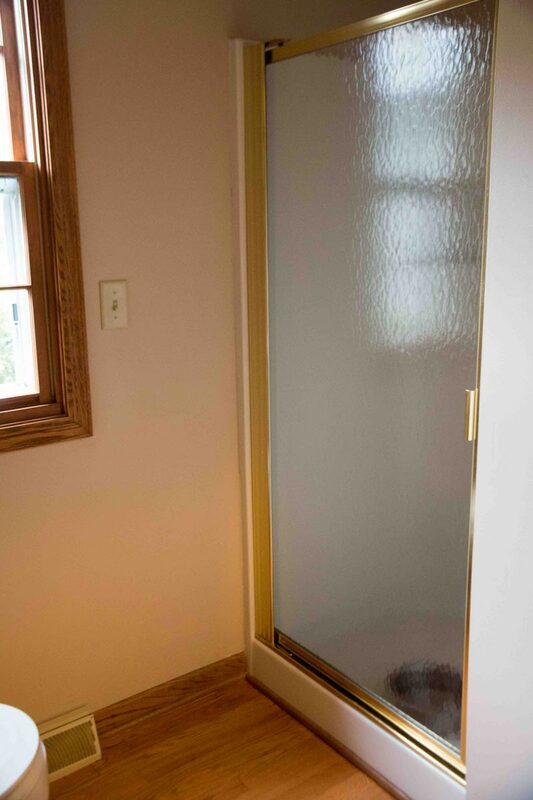 And that 1980s gold shower door we had in our downstairs bathroom? We hid it with a shower curtain (see the before in the picture below!) Put your shower curtain as high as you can. White is always a great neutral because it just disappears. 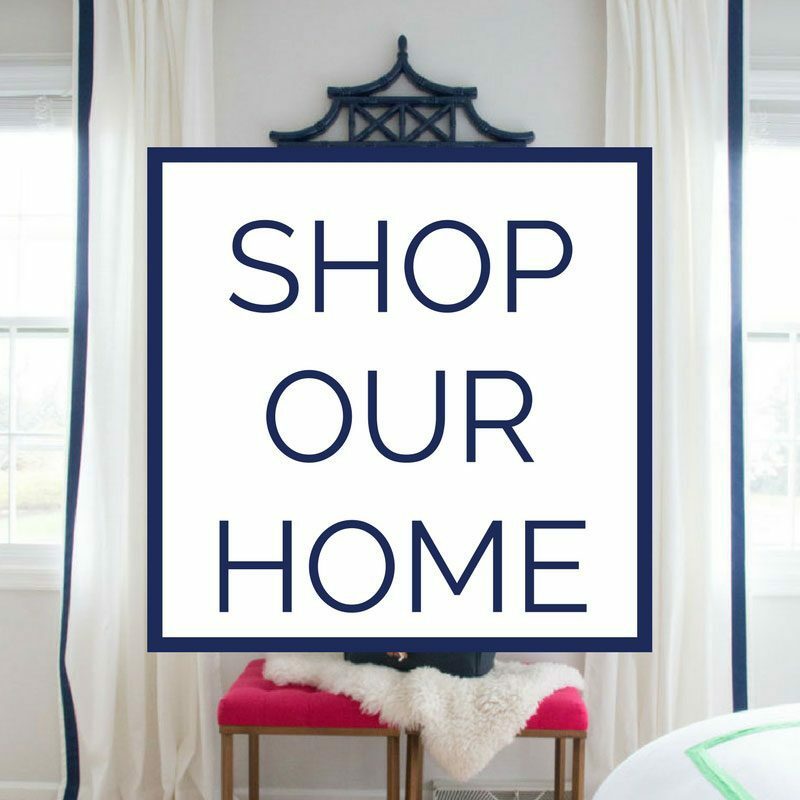 I found mine here (affiliate link). Lighting is an inexpensive way to update a space. 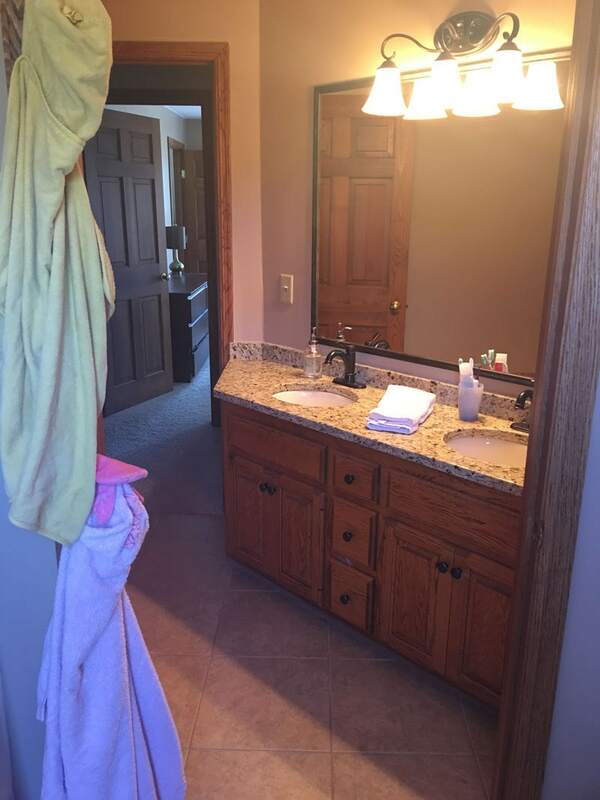 You won’t believe how dark our bathrooms used to be! Now, I am not saying make it into an operating room–heck, no mom wants to see the bags under her eyes that much! But, by upgrading your bathroom sconces or light fixtures, you will dramatically improve the look of your bathroom. 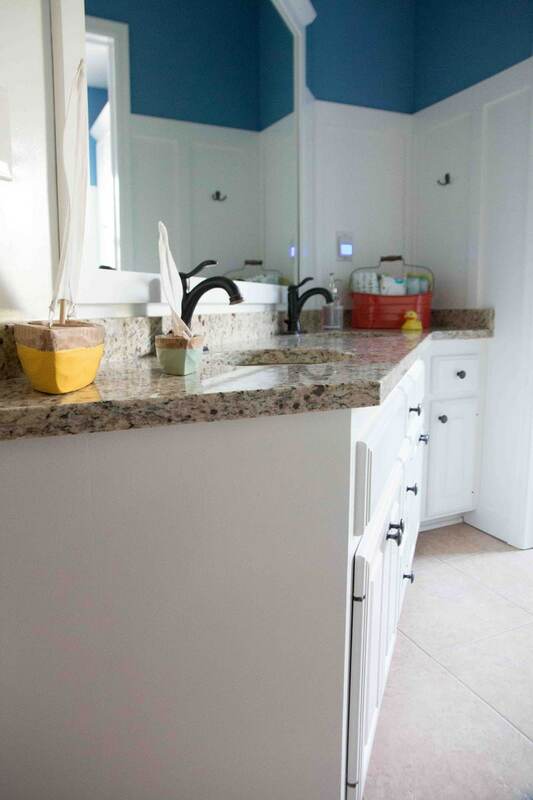 Think about using LEDs instead of incandescents–the light quality has gotten so good lately, we replaced all the lights in our kitchen with LEDs and both bathrooms. Just make sure to buy the soft white–these ones are great! Now, I don’t fret as much when the kids leave them on! 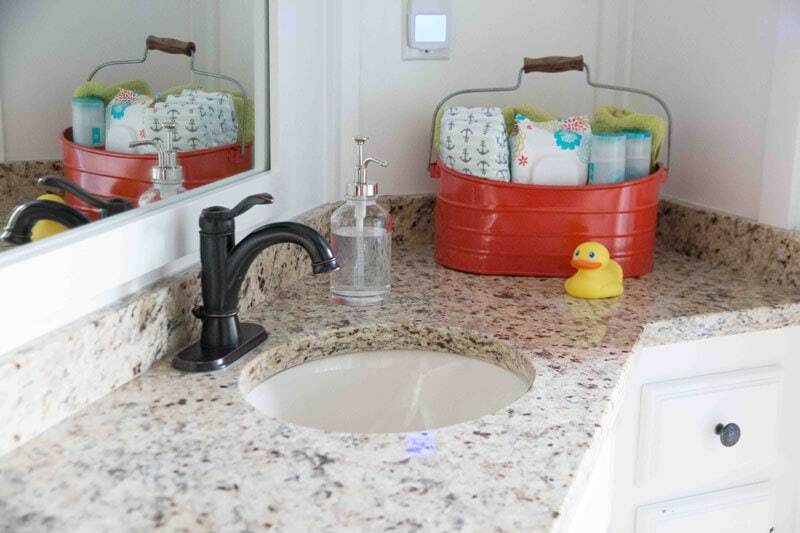 Sinks cost money, faucets cost money; but, cabinet knobs and pulls and towel racks? They don’t cost nearly as much! Any other Wizard of Oz fans out there? Or am I the only one! Well, it’s true. Like I said above, hiding outdated showers is easy with a cute curtain. 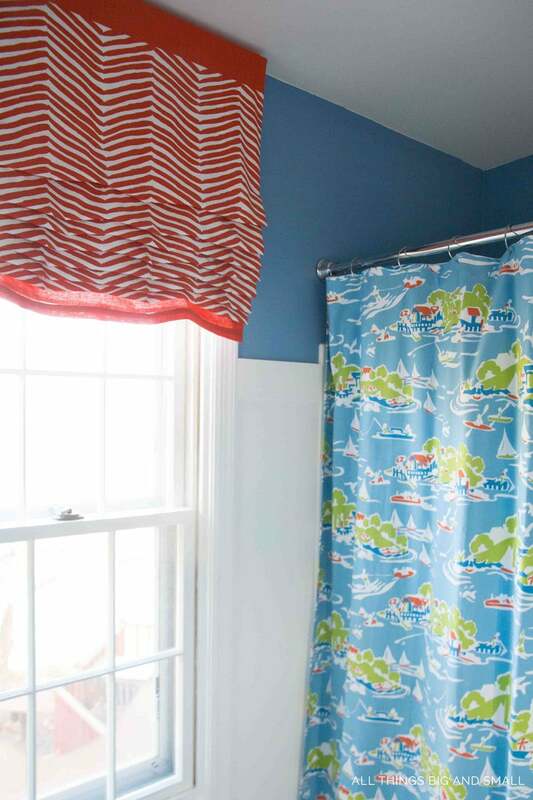 And even normal showers can be upgraded by a fun shower curtain. 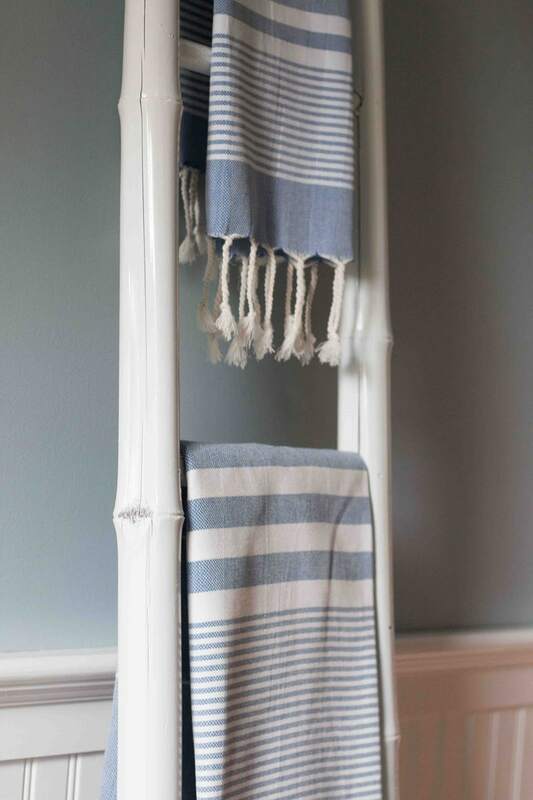 If you don’t want to spend that much money, you can always DIY it yourself with inexpensive fabric or patterned sheets! Nothing looks worse than a house with completely barren walls. I am all for minimalism, but a house needs to look lived in! 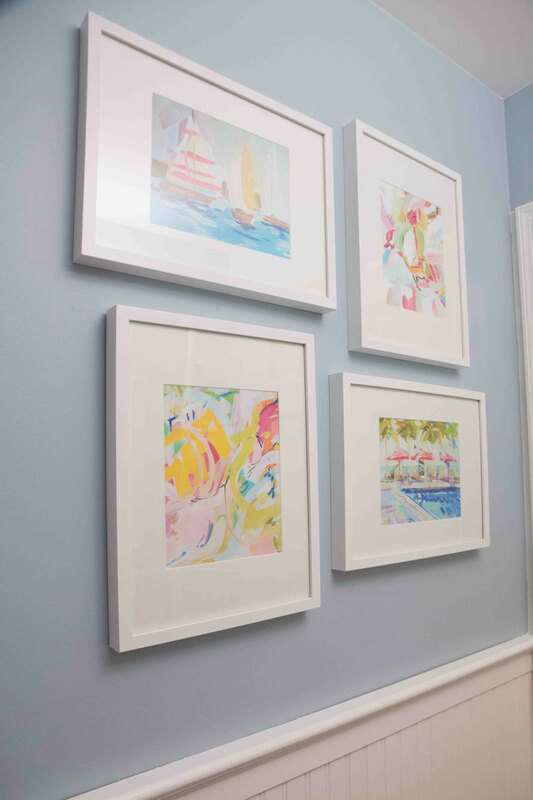 Add some budget-friendly artwork (see one of my most popular posts on it here) and suddenly your bathroom looks like any other room in your house. When you have an outdated bathroom, this is even more important. You don’t want people looking at the old stuff you can’t afford to replace, so draw their eyes to pretty stuff you can! 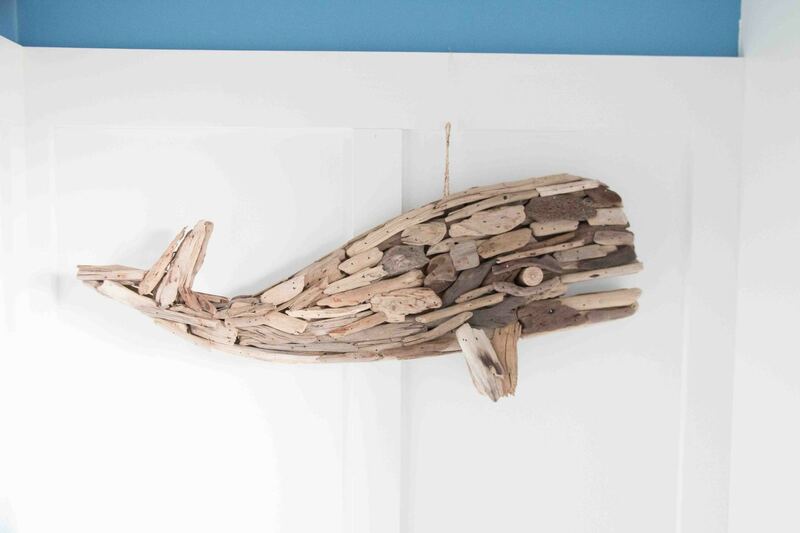 By mixing accessories and artwork you can give the room a well-rounded look. 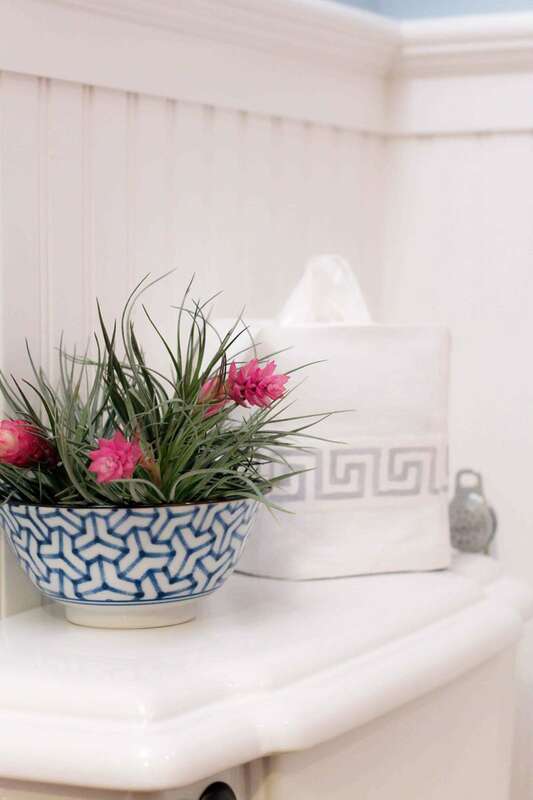 Add a decorative tissue box cover, some live plants, or some decorative objects like sailboats if they go with your theme. 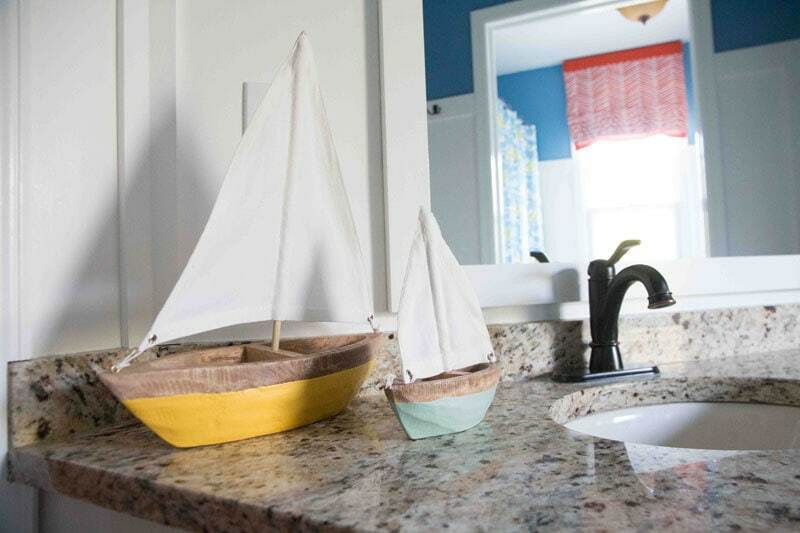 Our kids’ bath is nautical so cheap wooden sailboats from Target worked perfectly! HomeGoods is another one of my favorite places. 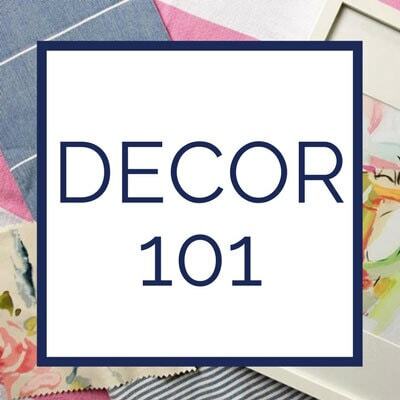 Here is an entire post on picking up inexpensive decorating accessories. 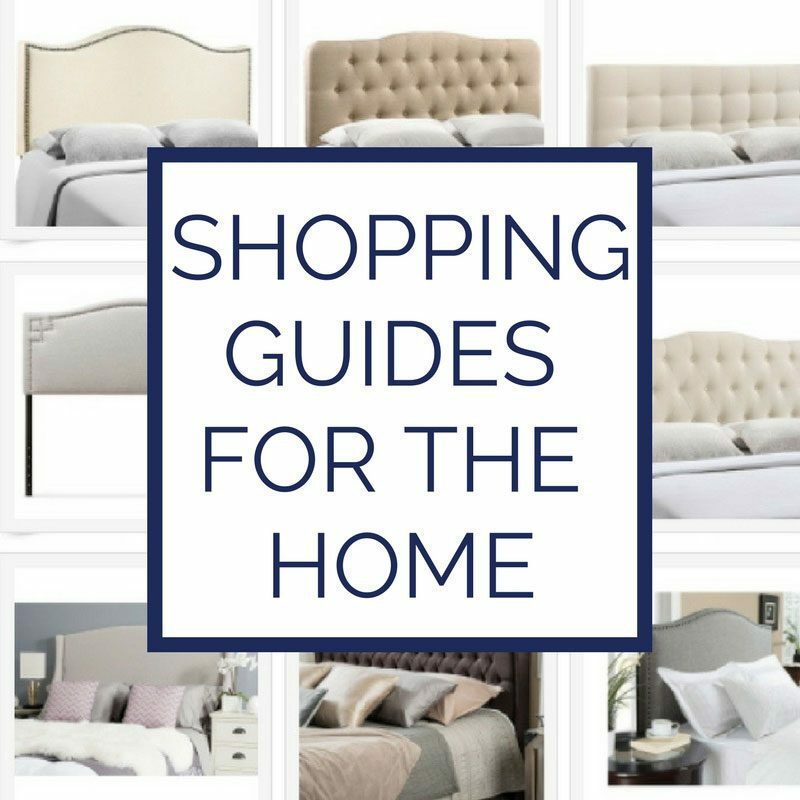 You don’t need to spend a fortune to add decorative accessories! By adding curtains, I created a visual illusion because it now looks like the windows are a whole lot bigger than they actually are. By putting the curtains as high as we could (see my guide here on the proper way to hang curtains), I pulled the eye up to the ceiling (which makes our meager 8 ft. ceilings look way taller.) 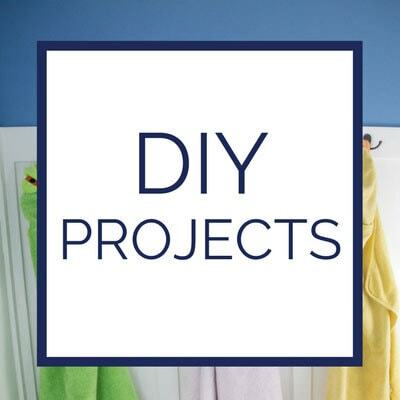 See my complete guide to making your own DIY fixed Roman Shade (the orange one in the kids’ bathroom) and the DIY Roman Shade (the one in the downstairs bathroom). And don’t think you have to spend a ton on the curtains! I made the upstairs one out of a $18 tablecloth! 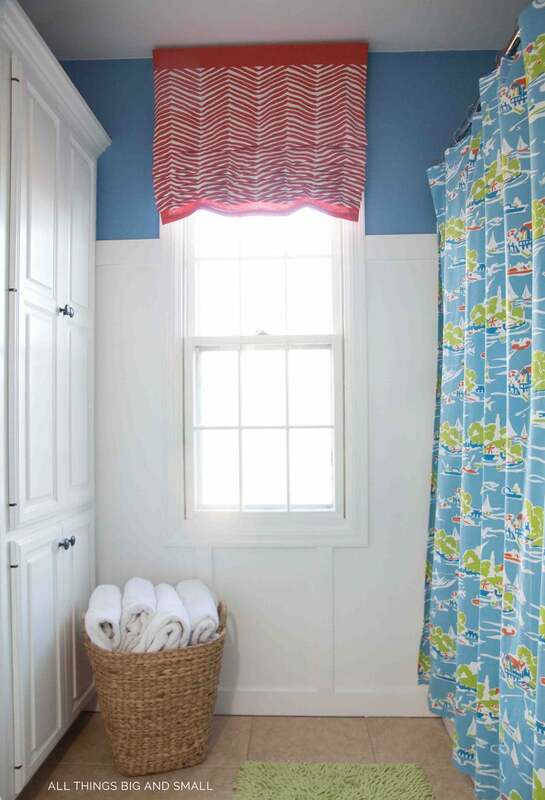 Bed sheets, tablecloths, and inexpensive fabric make great window coverings! Just kidding! But, we upgraded the look of the cheap looking mirror that the previous owners had glued to the wall (yep, that thing is not coming off!) by adding a nice crown moulding to it and taking out the thin black moulding–making it look much more substantial than it really is. It is the same exact mirror but it looks completely different! 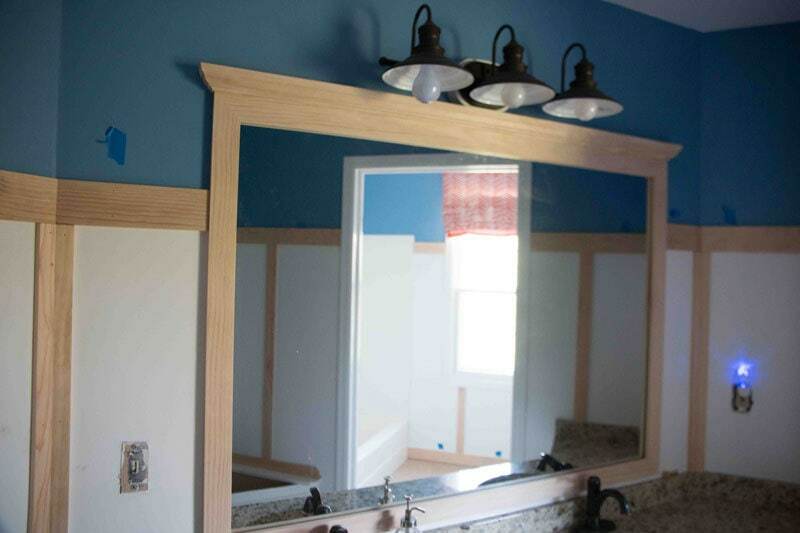 Framing your mirror is something everyone with a builder-grade mirror should be doing! 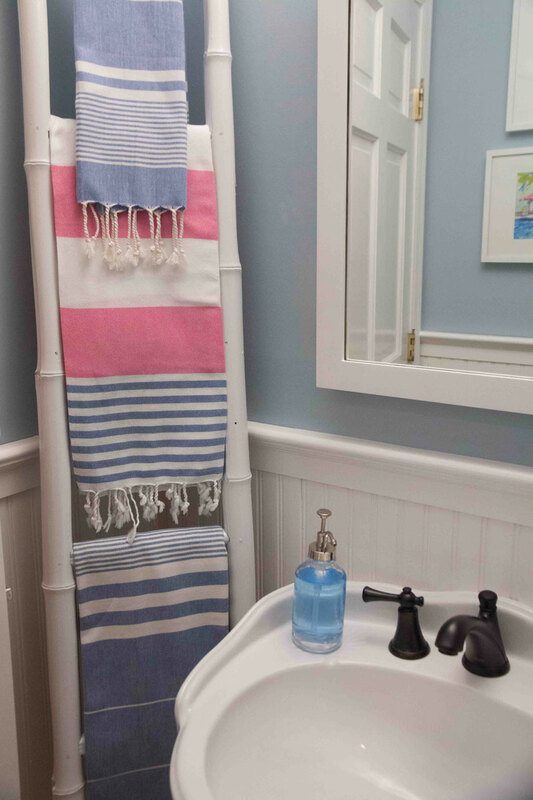 As a die-hard white towel addict, it is hard for me to say this–but, buy some colorful towels for your bathroom. 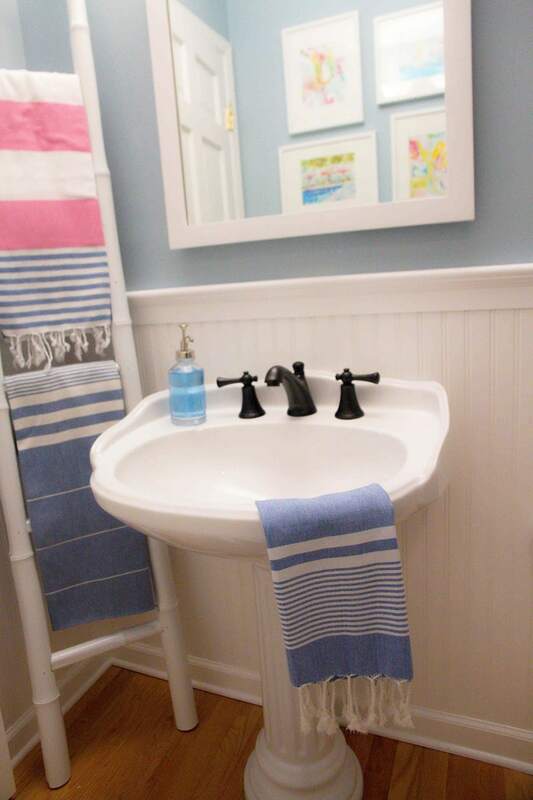 Since we only use our downstairs bathroom for the toilet and sink (no one ever showers in there), I used some beautiful Turkish towels that go with the colors in the rest of the room. 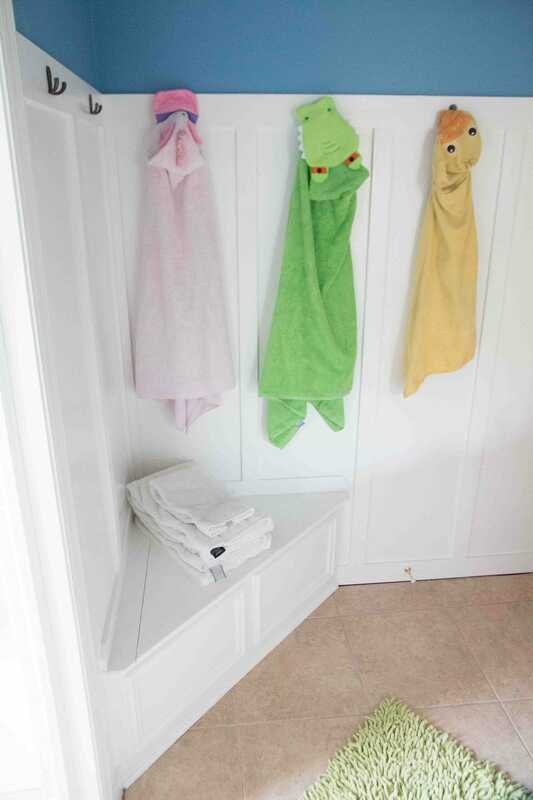 Upstairs, while we still use white body towels, I added some fun lime green hand towels for the kids to use, and stored them in a cute metal basket, bringing in the color of the rug mats and the shower curtain. 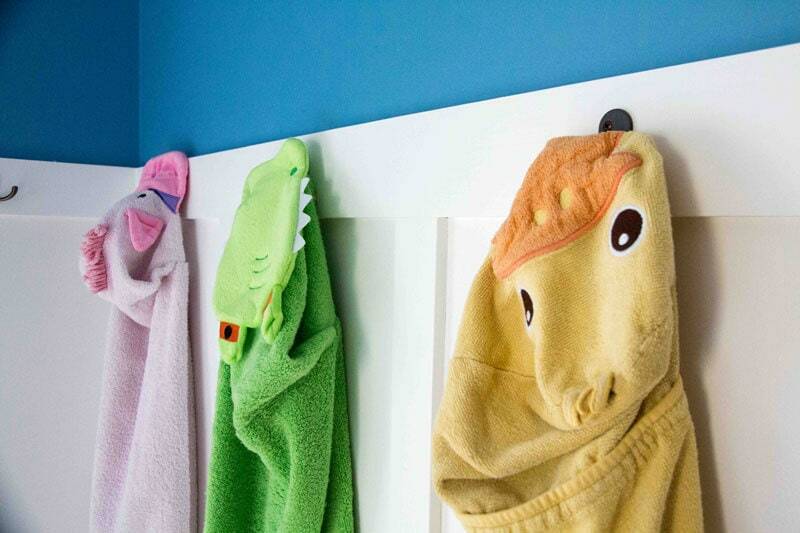 Their bright hooded towels they use every bathtime, and hang on the robe hooks bringing in extra color to the neutral board and batten. IF YOU LIKE THIS —–>> PIN IT! 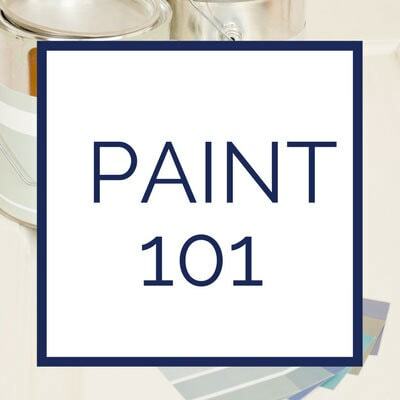 The Best Paint Tools You Need to Have! 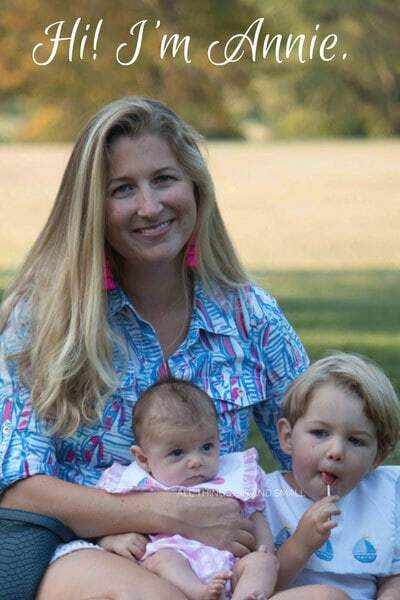 Budget makeovers are my favorite, and these are so well done! Love the remodels. The bathrooms look fantastic and so updated. Great job! Wow, you have done so much with a great budget! Both spaces look amazing and it all ties in so well together. Love it and very inspiring! Love this article! 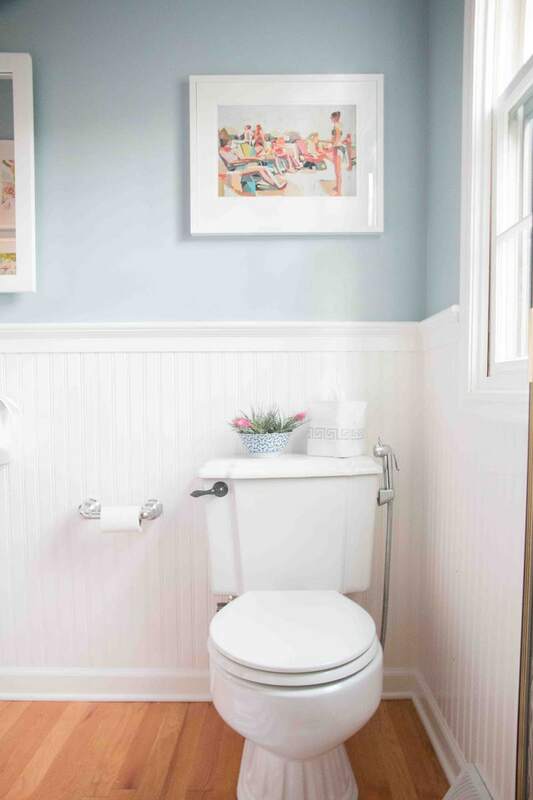 These are the simple and easy way to change the whole look of the bathroom on a budget. I am inspired by your work and got some great ideas. Thanks and keep sharing. Great Article…! 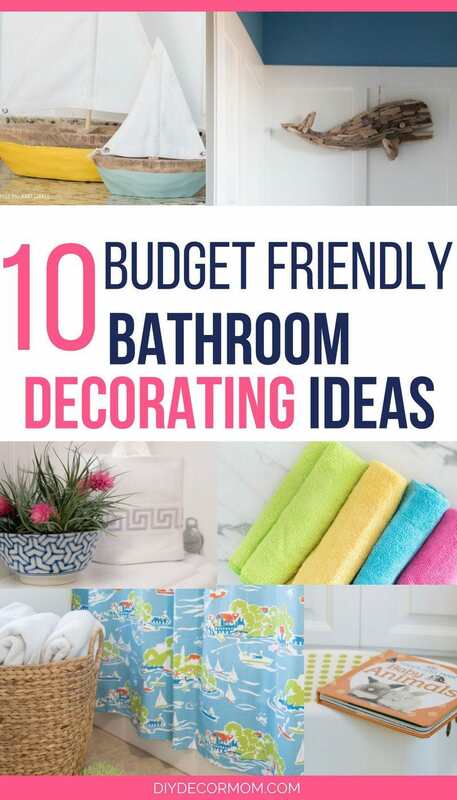 I get some informative information about bathroom decorating ideas on a budget. Really You are so creative. I like your tips and ideas.